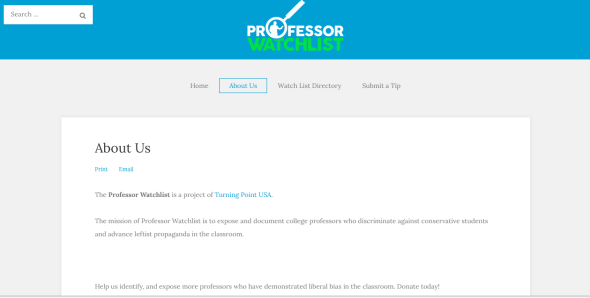 Professor Watchlist is a grotesque catalog of left-leaning academics. The timing of a new website meant to identify liberal academics is grotesque. 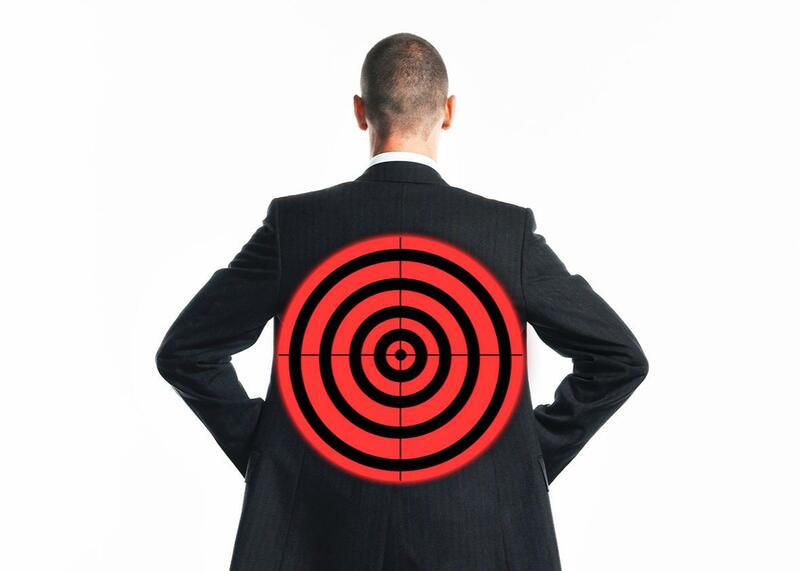 The watch list puts targets on the backs of liberal professors. This past Saturday, 200 white nationalists gathered two blocks away from President-elect Donald Trump’s future home, exulting in a victory that has catapulted them out of the shadows. This Monday, an organization called Turning Point USA launched a website called the Professor Watchlist, which provides the full names, locations, offenses—and sometimes photographs—of liberal academics it has singled out for ignominy. In any other year in recent memory on this continent, these would be two unrelated events. But in the United States in late 2016, as the president-elect’s surrogates cite Japanese internment as a “precedent” for what may come, any “watch list” of any sort is worrying. One that targets outspoken intellectuals with views that oppose a mercurial future president who spent the weekend tweeting petulantly at the cast of a Broadway play? Abjectly terrifying. The mission of the watch list, according to its website, is to “expose and document college professors who discriminate against conservative students, promote anti-American values, and advance leftist propaganda in the classroom.” The site invites users to nominate candidates, asking that they “submit a tip” about the nefarious pinkos who teach them (that’s S-C-H-U-M-A-N with one n, by the way). Some of the professors on the list have responded thoughtfully to their inclusion; others on social media have trolled the list with complaints about Indiana Jones and Jesus. Like any soulless golem, I love a good Jesus joke, but today even I can’t muster up the laughter. Just four years ago, in 2012—the year Charlie Kirk, then a Chicago-based 18-year-old who skipped college altogether, co-founded Turning Point USA—the watch list would have been great fodder for yuks, on par with David Horowitz’s obnoxious 2006 book The Professors: The 101 Most Dangerous Academics in America, inclusion in which was often a point of pride. Today, though, the Professor Watchlist causes me to fear for the safety of the people on it. He told me in no uncertain terms that he “denounce[s] completely” last weekend’s nauseating neo-Nazi Woodstock, and that the watch list’s launch had been planned for “months.” Its dovetailing with the white nationalists’ coming-out party—and the corresponding rash of grim, incredulous press coverage—was an unfortunate coincidence, and one that caused an unanticipated surge of traffic thanks to heightened media attention in the wake of the launch’s inauspicious timing. The intention, he said, is not to threaten or harm the professors—his commitment to free speech means he’ll “fight to the death” for their right to disagree with him—but to raise “awareness” for students and the parents who often pay their tuition. But the photos? I asked. Did Kirk at least understand my unease about the photos? They’re “just stock images,” he said, publicly available, like all of the other information the site has aggregated—aggregated, he emphasized, not created. Plus, “Nowhere do we say they shouldn’t have the right” to express their views; the site has “no calls to action,” whether that be firing or worse. I’ve no reason to doubt Kirk’s sincerity, but at this point, I also have to wonder whether the intentions of his watch list make a difference—and whether this is a bell that can be unrung. It doesn’t matter if the site wasn’t meant as a No-Goodnik Intellectual Kill List one day after Richard Spencer and his Jungen screeched Heil Trump. Intentionally or not, the Professor Watchlist, simply by being a self-styled watch list, has aligned itself with the ugly, frightening new political status quo. Yes, it’s true that Turning Point USA didn’t create any original material on its compendium, and its claims of professorial malfeasance—from using swear words to attesting that racism is a thing—are reputably sourced. It’s also true that beleaguered conservative intellectuals have as much of a right to grumble as liberal professors have to grandstand. And I will take Kirk’s word that he didn’t create the site with the intent to intimidate, threaten, or bring harm to any of the human beings on it. But what the site did do—what it continues to do—is compile a one-stop shop of easy marks and their precise locations, complete with descriptions of offenses against America, God, and the “children of the sun.” Whether it intends to or not, this list watches over us at our country’s darkest turning point, poised to inflame the tinder-dry, gasoline-soaked pitchforks of a mob that has just stepped boldly into the light. Don’t misunderstand me. The answer is not to take the site down altogether, for that would be censorship, and censorship is not the solution, just like it isn’t the solution when the 45th president of the United States gets his fee-fees hurt. But in this time of national reckoning, responsible conservatives need to pay attention to context. Why not, for example, a site that indexes classroom bias by incident and date, instead of by the professor’s name? All the self-satisfaction with none of the implicit death threats. I like to assume the best about people, and as such, I do not believe the terrifying effect of the Professor Watchlist is the “awareness” Kirk intended to raise about ideological diversity at American universities. As such, I hope his organization will stop stoking the worst impulses of authoritarian populism—before American conservatism reaches a point from which there is no turning back.